The Rams football team played their first game in their new Los Angeles home last month, and return to the L.A. Memorial Coliseum on October 9. Thank God, we have the Expo Line, right? The light rail transported 21,000 people to the game at the USC-adjacent stadium, allowing smart fans to avoid fighting gridlock and paying hundreds of dollars for parking. So, what happens when the team moves into their new, 70,000+-seat stadium in Inglewood in 2019? Well, fans will encounter a much-less transit-accessible stadium, one where the walk to the nearest train station is over 1.5 miles away. Uh-oh. That nearest station will be the Crenshaw Line’s Downtown Inglewood stop, currently under construction. Sure, hale folks will be able to trudge over to the new station, but will most ditch the train and attempt the drive to Inglewood? The worry is that the new stadium—going up next to an under-construction mixed-use parcel housing 2,500 apartments, new retail, a hotel, and expansive green space—will generate traffic armageddon during the six-to-seven home games. That fear is not unfounded; even with the Expo Line, the USC area was jammed solid last month. Thankfully, Metro is aware of the coming storm. Early this year, the transit agency convened a task force (called “Metro Line to Goal Line”) to look at ways to alleviate the traffic and transportation issues. Options being explored include aggressively marketing transit to games, working with Metrolink commuter rail to get folks from outside the city to not drive in, and coordinating “first/last mile” options. That last opportunity addresses the 1.5-mile gap between the Inglewood station and stadium. You can guess that Metro will stock the station with bike rentals and ample space for Uber and Lyft pick-ups; one can also hope the pedestrian route to the stadium includes wide, shaded, unencumbered sidewalks and scramble crosswalks. It’s likely that Metro will also look into shuttle bus service, like the Dodger Stadium Express, a bus line that runs from Union Station and the South Bay to the Echo Park baseball stadium. The DSE is free for ticket-holders and partially runs on bus-only lanes. A similar bus in Inglewood wouldn’t be a perfect solution, but it would help. 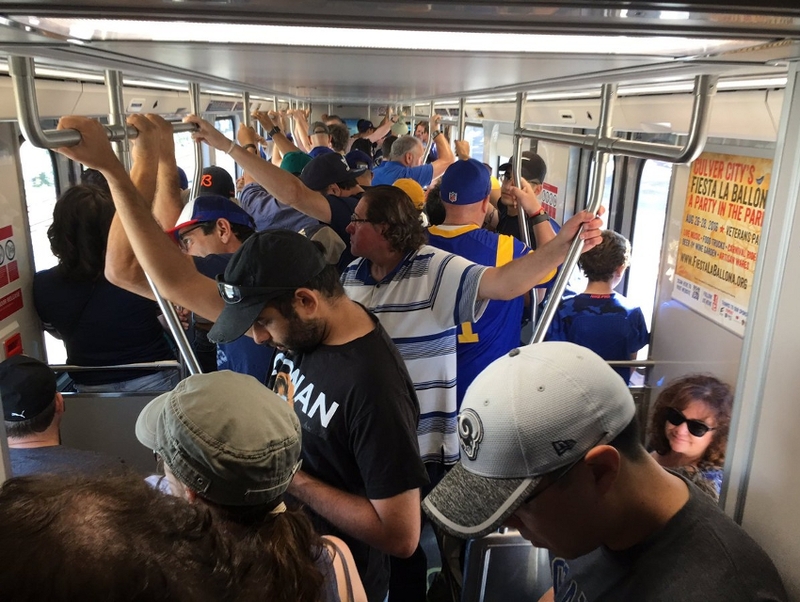 As Metro pushes Measure M—a November ballot initiative that, if approved, would provide billions for new transit, freeway, and bike projects—they’re also considering adjusting a planned extension of the Green Line that would get folks much closer to the Rams stadium. That idea is to reroute part of the Green Line (initially planned to reach Torrance) and send it to the new stadium, or possibly building a new spur to the stadium area. Without new funding, the project won’t start work for decades, but if Measure M passes you may be tailgating on Metro before we all sink into the ocean.